Handcrafted Blue Chalcedony and Topaz Dangle Earrings, "Harmonious Blue"
India's Neeru Goel presents a new awe-inspiring pair of earrings. 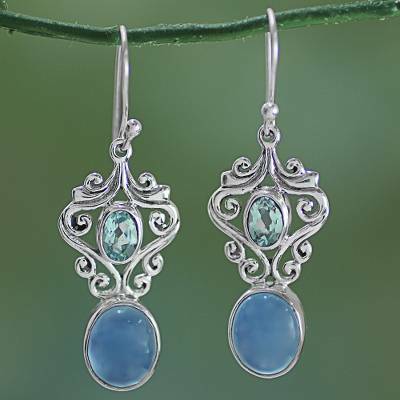 Whimsical sterling silver tendrils surround a sparkling blue topaz gemstone at the peak of each dangle earring. Below, a blue oval cabochon chalcedony stone is suspended from the high-polish sterling silver frame, making the calm blue tones the center of attention. You can find chalcedony and blue topaz dangle earrings 'Harmonious Blue' by Neeru Goel in jewelry categories such as Birthstone Earrings, Chalcedony Earrings, Topaz Earrings, Silver Earrings, Sterling Silver Earrings and Dangle Earrings. Enjoy exploring these sections for other Novica treasures. I just received these earrings last week and I've been wearing them ever since. They are so beautiful and even though they have a presence in the ear, they are so light that you hardly know you're wearing them. There's a substantial amount of silver and the stones are gorgeous. They can be dressed up or down. I've worn them with slacks and a blouse and with jeans and a t-shirt and they look great no matter what. I love these earrings so much. They are my new go-to pair. Buy them. You won't be disappointed. "Something to make you feel Lovely"
Once again ~ thank you for sharing your lovely creative talent ~ it is appreciated! I love these earrings. The colors of the stones are great, and the craftmanship is wonderful.